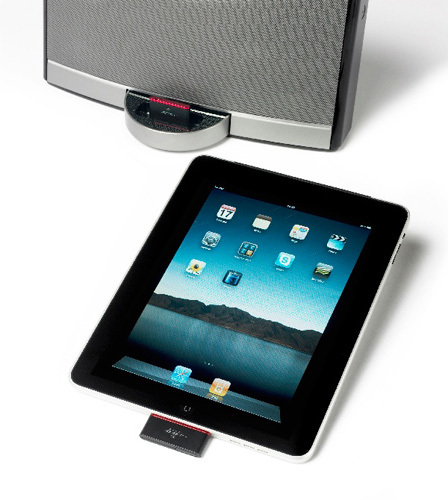 Your iPad won't fit into your iPod speaker system, so how are you going to get your music from one to t'other? And what if you want to use your iPhone or iPod Touch as both the source and a remote control for your dock? Enter the Airphonic wireless streaming kit. It comprises a pair of adaptors - one for your iDevice's dock connector, the other for the speaker's dock port - and beams "CD quality" audio between them using the Kleer wireless audio system. Kleer operates in the noisy 2.4GHz band - as does Bluetooth and Wi-Fi - but segments it into 16 channels and rapidly auto-hops between them to ensure the best signal. The two dongles auto-pair on first use, though you can link them to more devices later.